We need your help at ASU Open Door! 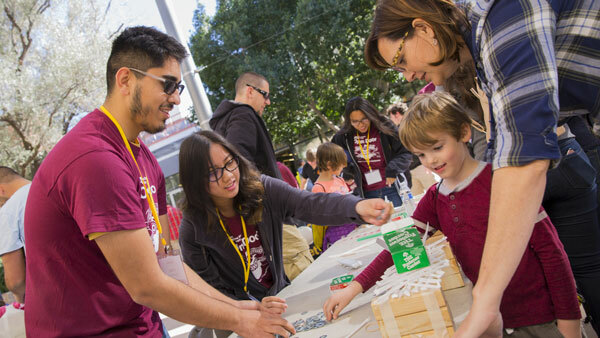 The Tempe and Polytechnic campuses will soon host visitors to explore and experience the creative energy that powers a world-class university — and the Fulton Schools play an important and major role. You can help us make this awesome event a success! Volunteer positions range from assisting with hands-on activities to helping set up and clean up. Volunteer hours: 10:30 a.m.–6:30 p.m.
Volunteer hours: 10:30 a.m.–7:30 p.m.
Volunteer more than three hours and get a free meal at the end of your shift! Questions? Contact Elizabeth Cross at elizabeth.cross@asu.edu.